(Raffa) – In the presence of the Deputy Chairman of the Rashid Equestrian and Horse Racing Club High Committee, HH Shaikh Isa bin Salman bin Hamad Al Khalifa, the Rashid Equestrian and Horse Racing Club held the second race for this season, 2017-2018, at its racecourse in Raffa, Sakhir. Shaikhs, representatives of sponsors and horse-racing fans attended the seven rounds of the race which was held over the cups of the late Sayed Sharaf Al-Alawi, the late Abdulhadi Al-Afoo and the Al-Sakhir Stable. 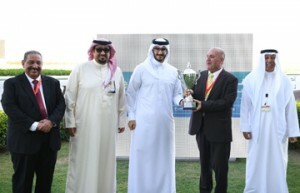 HH Shaikh Isa bin Salman presented trainer Abdulla Kuwaiti with the trophy of the Al-Sakhir Stable cup. Meanwhile, Khalid Al-Alawi crowned trainer, Allan Smith, the winner of the the late Sayed Sharaf Al-Alawi’s cup, and Director-General of the Al-Afoo Company, Abdulridha Al-Afoo, presented the trophy of the Abdulhadi Al-Afoo’s cup to trainer Ramzi Al-Baqlawa.